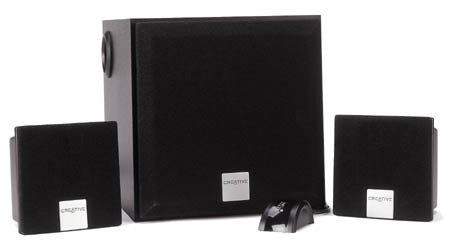 I have a rather old set of Creative speakers called Inspire 2.1 2400. The original cable that connects them to the computer was of poor quality, and at some point I had to replace it. The original cable had an external volume control (you can see it in the photo). I replaced it with a normal cable. Since then, I get static noise when the computer is off, so I have to turn off the speakers together with the computer, which is a hassle. I tend to blame the new cable, but I don't know how to choose a cable that won't cause this noise. Edit: following the replies and comments here I did some more tests. When I disconnect the audio cable from the speakers, there's no noise. When I connect the audio cable to the speakers only (not to the computer), they are very noisy. When I connect the audio cable both to the computer and the speakers, and the computer is off, there's noise. But it's less loud than when the cable isn't connected to the computer. It doesn't matter if the computer is connected to the power source or not. The noise persists when I disconnect the power cable. Finally, the noise doesn't stop when I turn the computer on, only sometime during the operating system start-up. BTW, my mom has an identical set of speakers and she has the same noise problem. Edit2: the noise may be described as hum. It's very similar to the 50Hz example. Typically that noise happens when computer and speakers have different ground levels, explained here. Are you sure that you did not also change anything in that regard, different outlets, etc? Is your pc connected to other devices, antennas, network switches, etc? Try connecting your speakers and computer at the same power outlet, with an extension cord. very odd behavior, looks like there is something wrong with the cable or the speaker system itself. Is it a hissing noise or a deep hum? Sounds to me like your new cable is acting like an antenna and you're picking up the static from there. Try a cable with thicker shielding / insulation and see if that helps. Actually, when you turn a computer off, it's not always completely off, just more in some kind of "standby" modus. Ever had an USB light connected to your computer? Did it go out when you turned your computer off? How about the lights at the back for your network card? (Some have lights there!) Are they off too, or does it support a wake-up call from the network? Keep the cable connected to your speaker, but plug them out of your computer. If you still get noise, the cable is the problem. Otherwise, the computer still generates noise even though it's supposedly off. Since you've added more comments to your question, a second answer... As you say, when you connect the cable to your speaker only, it starts to generate more noise than usual. That seems to suggest to me that the cable is working like an antenna, picking up random signals and sending these to your speaker. If your mother uses the same speakers and cable, and she lives in the same area as you do, then there might be something in the area that is causing those signals that are picked up by your speakers. Connecting the cable to the speaker is actually reducing this signal since it's now divided by the computer and speaker. Maybe you need a cable with better isolation from those external signals. I'm not that big of an expert with this since I never had much problems like this. It could be that you're close to a GSM broadcast antenna and the cable is picking up random noise from it. To check this, try wrapping the cable in single layer of aluminium foil and check if the noise goes down a bit. Or connect the cable to a speaker in another room. If it does, you'll need a newer cable with better isolation. (No, you don't want to keep that cable wrapped in foil!) Such a newer cable might be expensive, though. And it's no guarantee that it will work better, so turning off the boxes with the computer might be a better option. My guess is that the old "poor quality" cable had a ferrite bead in the volume control and that filtered out this noise. Either that and/or you ran this cable differently than the other one. What ground are you connected to? Is your power outlets grounded? No ground at all can also cause this type of problem, since you can become more receptive towards external noise. "Static" noise is not a hum but a scratchy noise of varying amplitude and frequency. 50/60 Hz induced hum from power run around the place is possible from the description but that's a lot different from the "static" described. On the other hand that noise continues when the amp is disconnected is quite possible as the capacitors in the circuit may hold charge for some time after switch off, operating the amplifier at a reduced level and perhaps amplifying induced noise or connector resistance noise. If this noise continues for longer than say ten minutes it's unlikely to be from the disconnected amplifier (and is the amp actually turned -off?" and likely to be induced from some nearby source such as a switch mode power supply or some noise being fed into the mains from some source, perhaps not even at your house, and radiating.It's possible but unlikely that metal dust is caught between magnet and cone. Finally noise from poor battery connections in the amplifier or poor speaker connections or the amplifier acting as a low level transmitter through poor feedback design, say, are other possibilities. I had this same problem and fixed it by moving my wireless router further away from my sub-woofer. Not too sure why but it's fixed the problem. Quick input if no one else has found the same solution. A roommate of mine was using a lamp that had some sort of crazy power usage/radiation and some heavy duty cabling I was using for a very large sound system was picking it up. Trust me when I say the simplicity of the solution was more frustrating than the issue at hand. I literally tried every form of grounding, cable swap, etc and then finally just reproduced the last environment when the system worked perfectly (all the lights were off during a house party) and lo-and-behold- big, evil lamp. Not sure if this applies, but maybe itll help someone else. Cheers. Not the answer you're looking for? Browse other questions tagged cable speakers noise or ask your own question.